The highest quality materials in the industry today! The best customer service from start to finish! Up front pricing that includes the top upgrades possible. Some of the most experienced crews in the field. For over 30 years, Dillon Construction has provided our customers with the highest quality service and end product possible. 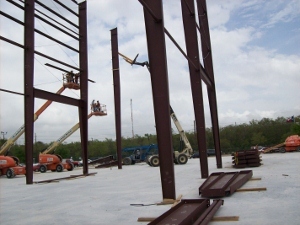 We specialize in Metal Building Erection, Sales and Service. We have been in business since 1992 and our key personnel have a combined experience of 160 years in the metal building industry and average over 22 years experience each. In the last three years we have doubled our sales each year and in 2008 our sales exceeded 3.3 million dollars. Dillon Construction projects range in size from 1,200 square feet to 400,000 square feet and average size building exceeds 20,000 square feet. We complete approximately 75 projects a year and does this with one of the smallest office staffs and some of the best crews in the industry.